Or, theoretically I could. But I’ve never actually made an empanada before. And 70 seems like an awful lot of empanadas. Traditionally, fifth graders work on a group project studying some country in Central or South America, and each group is supposed to provide a sample food from the country for every other fifth grader in the school. They like to do these things in June, which a conveniently slow time of the school year for no one who actually has children enrolled in school. But it’s fun in school, so I’m willing to go along with it. “No, my group’s pretty confident that they don’t want to help at all,” J answered. I think I might have snorted at that answer and its deadpan delivery. Fair enough. It’s my turn. Come to think of it, I wonder if the teachers ponder this as they form the groups, trying to distribute the parents who are most likely to cook so that there’s at least one to a group? Anyway, I talked J down from empanadas, and she moved pretty quickly to fried plantains. Meanwhile Cute W suggested we just bring in grass cuttings, since Venezuelans are experiencing all sorts of food shortages. Which made me give him a dirty look and tell him that that wasn’t funny, and he was saying, no, of course not, it would be a dramatic representation of how bad things were and spur global awareness among the kids. Maybe there’s something fundamentally, like, tacky about passing around huge trays full of treats to our well-fed children while the country we’re talking about is basically imploding. Also, incidentally, the no-snack statement would be a thrifty choice and prep time would be a snap. Compelling as these arguments were, J was not inclined to deviate from the delicious snack plan or learn more about current events at all, really. Believe me, I tried. But she has learned that this grade is all about sticking strictly to the assignment and not mucking around with creativity or intellectual curiosity. Oh, wow, do I sound bitter about this year? Sorry. We’re ready to move on to middle school. So. . . plantains. I started Googling around, and I found Mommyhood’s Diary, a blog by a mom who hails from Venezuela and shares tons of recipes. Hooray. I got even more excited when I saw some cool sauces. 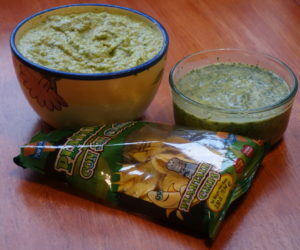 Chips and dips seemed like an excellent choice for potentially fussy eaters. Even though it’s a full two weeks before the presentation, J was very anxious for us to do a trial run of the recipes I’d found, so over the weekend we made tostones, cilantro mojo sauce, and guasacaca. The tostones are plantains fried twice. These were tasty. We tried one plantain prepared exactly as described in the recipe, then, with the second plaintain, I made the pieces a little less than half the size because I’ll need to make at least 70 of them, but also to go for a more chip-like consistency. I also brought home a bag of already-made plantain chips, but my child has been brainwashed over the years to believe that homemade is best. She thought that the store-bought plaintain chips were too much like any old chips. The first sauce we made was the cilantro mojo sauce, on the right, and it is incredibly yummy. It’s got tons of cilantro, of course, but also vinegar and orange juice and garlic to give it a piquant flavor that’s an excellent contrast to the relatively tame plantains. It tasted a lot like the green sauce you can get with empanadas at Schenectady Greenmarket‘s La Empanada Llahma booth. The guasacaca, on the left, is avocado-based, but it’s not guacamole, or at least it’s vastly different from the guacamole we eat. It’s got onion and Worcestershire sauce, among other things, and it’s super-creamy and delicious. We loved-loved-loved both of them. They tasted like stuff we’d buy at a restaurant. Both recipes were also very easy, just throwing a bunch of stuff in the food processor, puree, and you’re done. In fact, I thought the dips were such a raging success that I suggested that we might want to do the bagged plantains so that we could focus on the delicious dips. Was it transparent that I was trying to shirk work? I don’t know, but J maintained her extreme tostones enthusiasm. One shred of hope remained. We set aside a few of the tostones-like-chips to cool completely. I’d pointed out that fried stuff wasn’t always that great when it was cool, so we decided to test a few by leaving them out for a while and coming back to them later. That was the plan, anyway. Hours later, J reported to the small plate of plantains and found it empty. What happened to the plantains? So does this mean you are making the homemade plantains for the entire 5th grade? Great story! Alas, yes. And both dips.